I've had 5 fox bodies and said I would never get another Mustang. I have had three 3.8L cars and said I would never get another one. I've also had two convertibles (Mustang & Miata) and said I would never get another one. Well... a 3.8L convertible 5-speed popped up locally for $500 and I bought it last night. (Will someone please buy it from me?) It fought us. It really wanted to sit in that spot on the dude's driveway until it rotted away, but I refused to let it die, for now. It's been a few months since I sold my second car and I've been incessantly looking for something else, but I don't have much cash to spend. I wanted something I was somewhat familiar with so I wasn't learning something completely new. The goal with this car was to have something I could register and insure when my brother is on leave so he has something to drive. I also needed something that they would let me autocross. (They won't allow the Jeep.) I don't know what other racing I will get into, if anything, but I'm starting at the lowest barrier to entry for now. I know it's not the ideal car to start with, but I couldn't argue with the price. It fought us all last night, so I didn't end up getting pictures. I'll take some tonight. Any tips, tricks, or links you have for the problems I've listed, I'll appreciate the help. Otherwise, I'll start searching and reading after work. I just wanted to get the build thread introduced. I got a battery cable repair kit for the ground cable at O'Reilly, since the positive looks good enough for now. I might chop that end off and repair it soon too. I got slightly further with it. I heard a relay pop when I tried to start it, and then everything was fairly dead after that. Prior to that, the mileage displayed and a lot of the other warning lights behaved normally, which they weren't really doing before. So I think there's still a bad ground somewhere, or I need to clean those cables some more. Also, I'm pretty sure I heard the fuel sender running. So that might not be bad. As promised, I got a picture of the car. It's cramped in the garage with all the house renovations going on, so this is the best I can do for now. I took the radio (and facory CD player) out. A couple days later I hooked the battery up for some reason and now it's turning over. I haven't gotten it to fire, but I've made progress by doing nothing. Weird, right? I finally got someone to lend a hand with starter fluid, and it ran! I'll be going through the fuel system electrical this week, and investigating the condition of the fuel system itself. I have no idea it went from the relay shutting down the circuit to running without me making any changes. Truly bizarre. 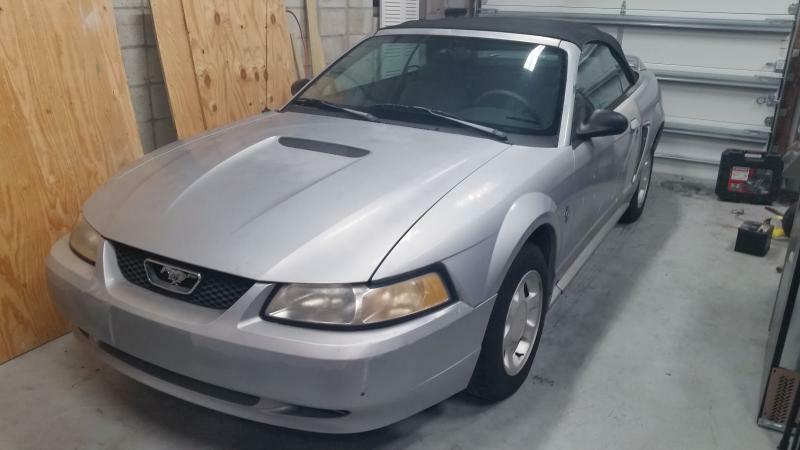 I had an issue with a 99 mustang I purchased no crank, and no start condition. It ended up being the fuel pump driver module, and the fuel pump was bad along with an aftermarket anti-theft system. I replaced both and removed the aftermarket anti-theft, and I have had no issues ever since. However the car sits most of the time now. Good luck getting it running. Forgot to check in... The car runs. All I changed was the fuel pump. There might be an electrical drain somewhere, and a bad ground or two. This thing is much rustier than it should be. Anyways, I'll post back when I get some other things cleaned up. I'm looking at what a 5.0 (SBF) swap would take right now.